All about my 1966 MC850 restoration. After my last post, I thought it would be quick work to tidy up the donor wheel housing, weld it in place and mount the car up on my rotisserie. Well, most of you know how plans like that work out. 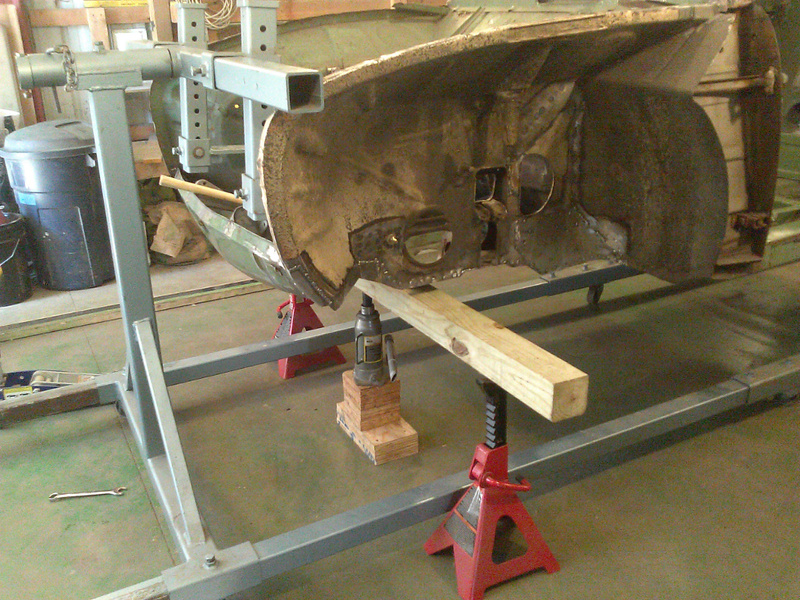 The donor wheel housing repair work was much more complicated than I expected; the original right, front wheel housing needed some similar repairs; the front cross-member section needed new ends due to rust; the cross-member had been deformed by an accident and needed straightening; and the floor pan was pushed back a bit on the left,front side. All this work had to be completed before I could even start installing the donor wheel housing. 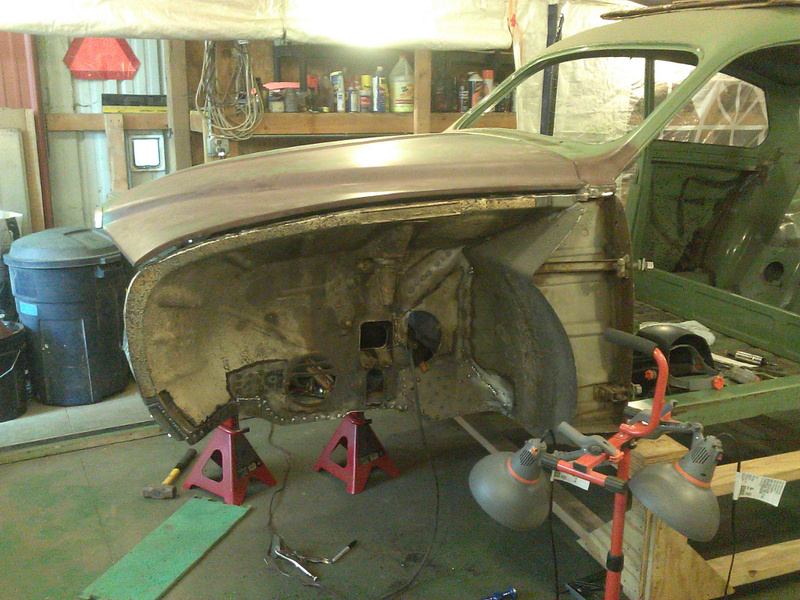 The good news is that this work is all done; the body is perfectly straight and true; and it’s now up on the rotisserie. If you’re inclined to read long boring posts, read on. On the other hand, you might just like to browse through and look at the 41 photos. Whatever, suit yourself. I’m just happy to have reached this milestone. 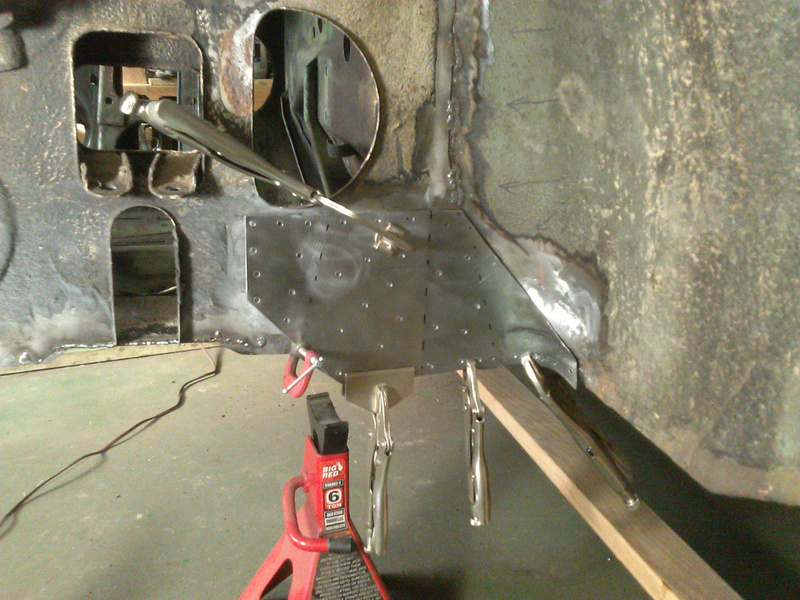 Front Cross Member Straightening and Repairs. 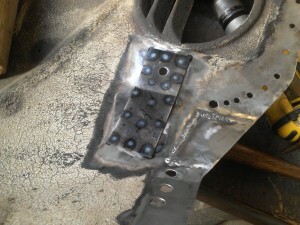 The photo to the immediate right shows the front cross member with most of the spot welds drilled out for removal. 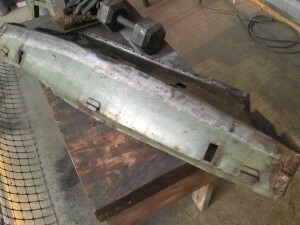 You can see that it would be difficult to straighten in-place, and the rusted ends would be nearly impossible to rebuild with the wheel housing interference. The second shows the cross member removed. This sequence of photos shows the condition of the front cross member after removal. 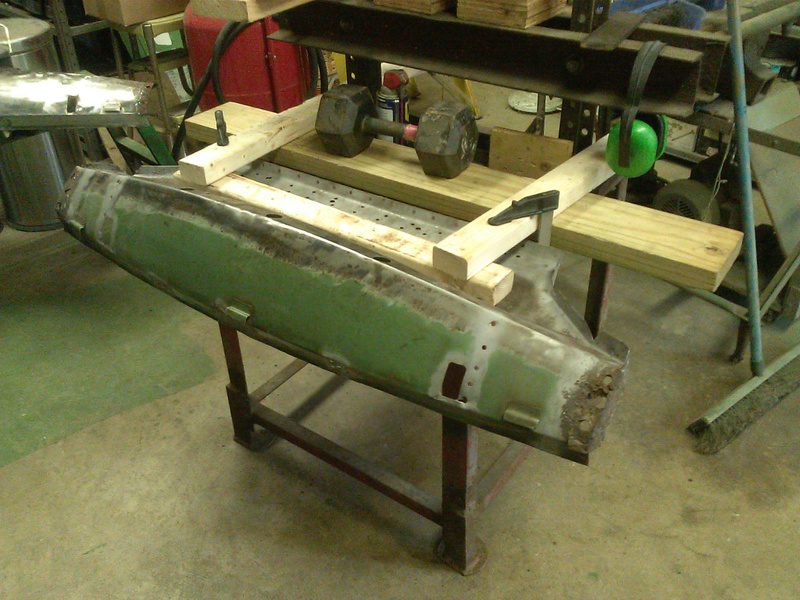 To make the straightening and flattening process easier, I decided to remove the radiator supports and the bumper arm supports. You can see fatigue cracks near the engine mount area in the 3rd photo, and I removed the engine mount reinforcement to make crack repairs easier. 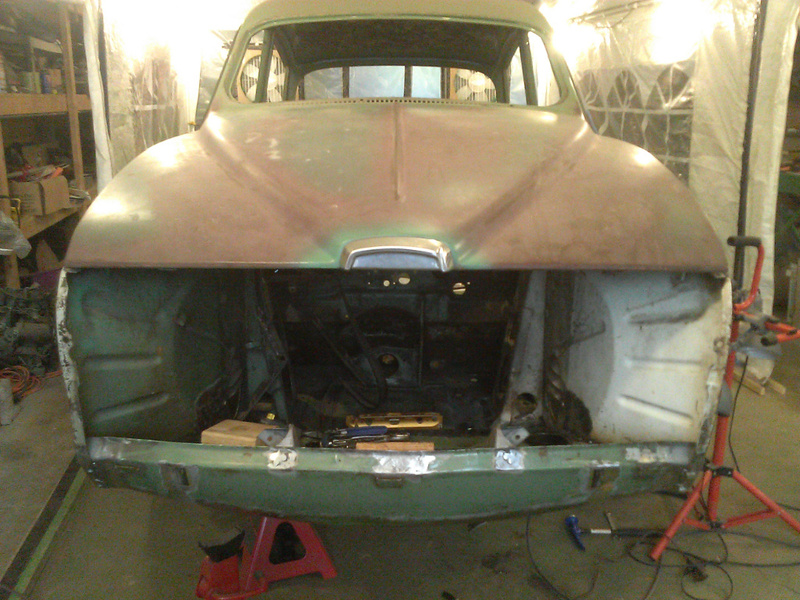 I was glad I did because the entire area under the reinforcement was filled with old oil and gunk which could have come back to haunt me come painting time. 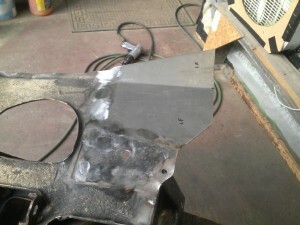 Oily metal doesn’t weld well either. After much careful hammering with the sheet metal hammers and the planishing attachment, the metal was smooth again but the smoothing process caused the back-most bend angle to change a little. To adjust this bend back to its correct angle, I cobbled up a makeshift clamping means which enabled me to accurately correct the bend. 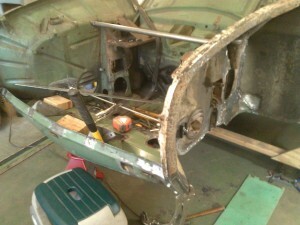 I mentioned earlier that the engine bay floor had been bent back a bit due to a collision. 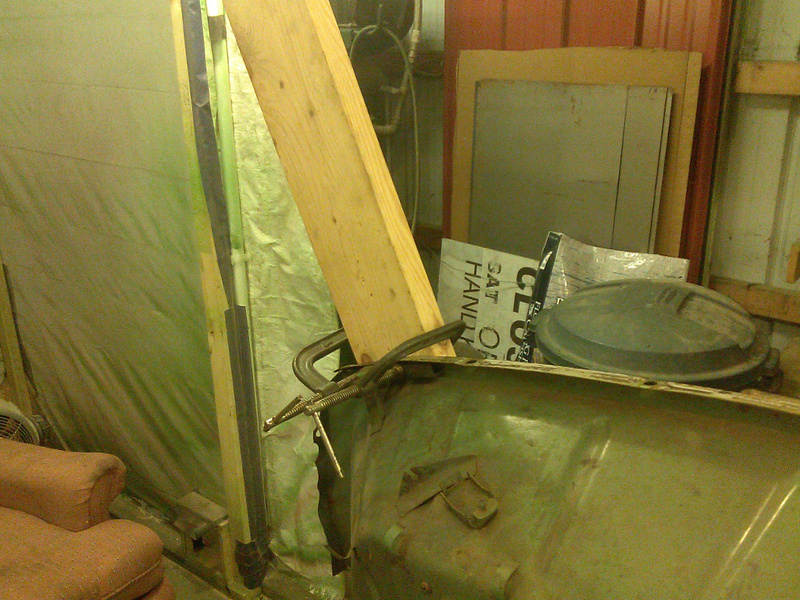 All it took was some two-by-fours and some C-clamps to give me the necessary leverage to correct the bend. 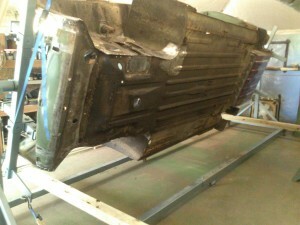 This put the engine bay floor back to its original shape. It was only bent on the driver’s side so I only had to match the angle on the passenger side. 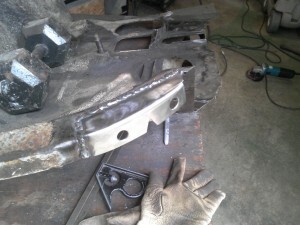 However, because of the collision on the driver’s side, the front and top-front of the passenger side wheel housing had been bent in toward the engine compartment somewhat. A similar process using C-clamps, lumber and 3/4″ square metal tubing made correction an easy process as shown in the 2nd photo. 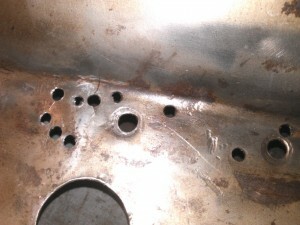 The front, bottom corners of both wheel housings were rusted badly where they overlap the front cross member which had also rusted. 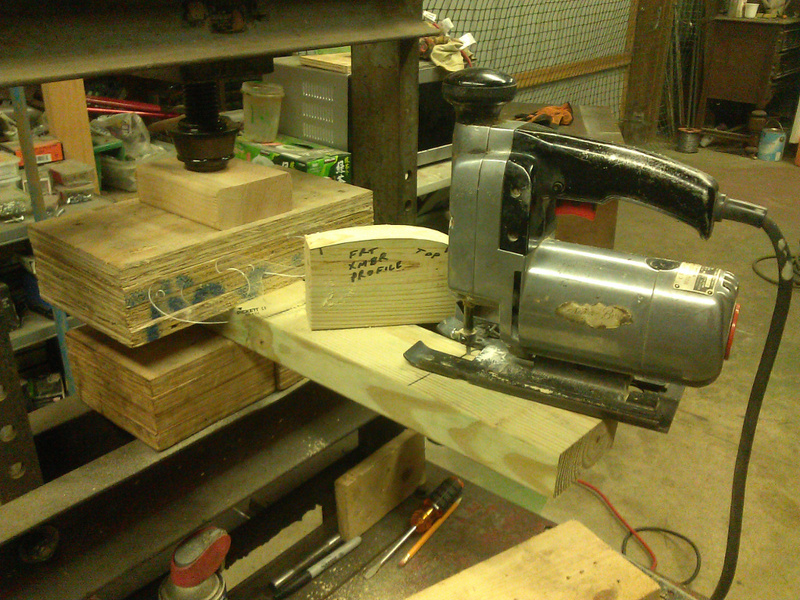 To match the curve smoothly, I needed a form to hammer the patch on. That’s what I’m cutting in the first photo. The second photo shows the patch being formed. I used the planishing attachment for a smooth finish. The bumper mounts to a reinforced area of each wheel housing. 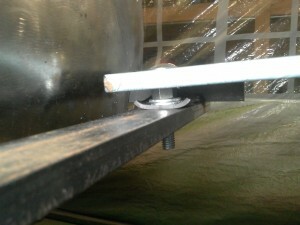 Water between the reinforcing plate and the wheel housing caused rust. 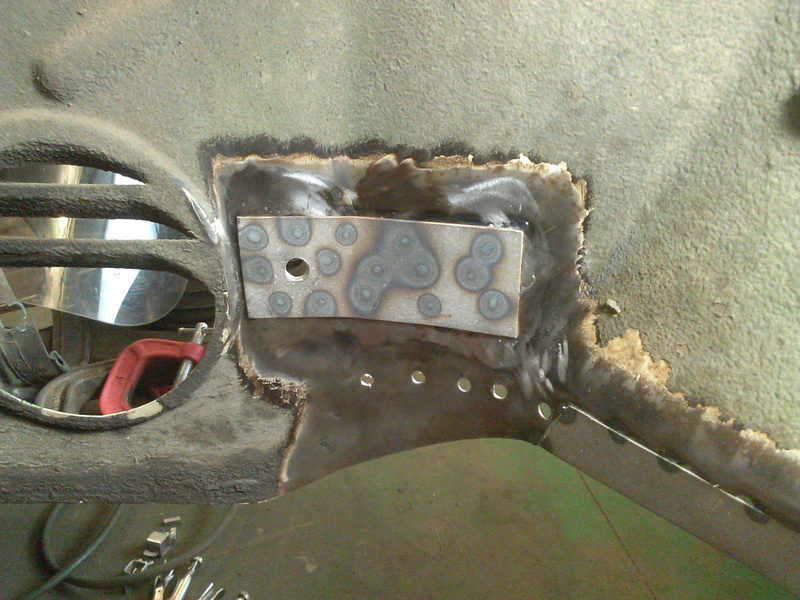 Both sides were cut out as seen in this photo, and each 18 ga patch sandwiched with a 16 ga reinforcement was bent to get matching bends in each piece. Here, I’m forming patches for each end of the front cross member. I obtained dimensions by carefully matching another uncut front cross member. Here, I welded the passenger side bumper mount patch. 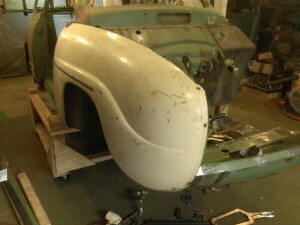 The first photo is the reinforcement on the outside. 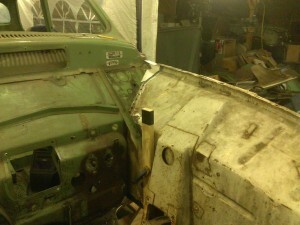 The second photo is inside the engine bay. You can also see a patch welded to the bottom front corner of the wheel housing. 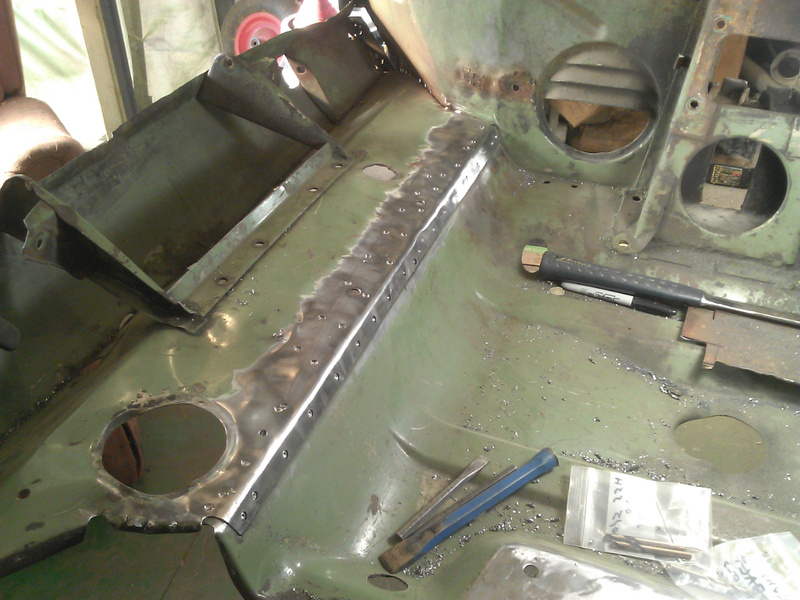 This is the reinstalled front cross member. 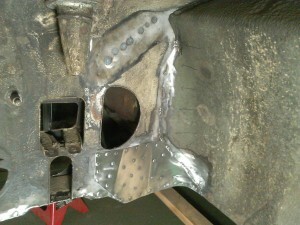 The second photo is a closeup of the wheel housing to cross member interface. The welding matches that of the factory as close as possible. Rather than square welded-on nuts, I used grade 8 flanged hex nuts for the broader mounting surface. Just to make sure everything still lined up after all this patching, I test fitted a pristine fender with fender beading in place. Everything fit just fine. 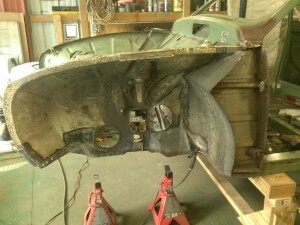 The donor wheel housing was solid everywhere except 3 corners and the bumper mounts. I already had a patch made for the lower front corner, but the 2 rear corners were going to take some time-consuming work to rebuild. 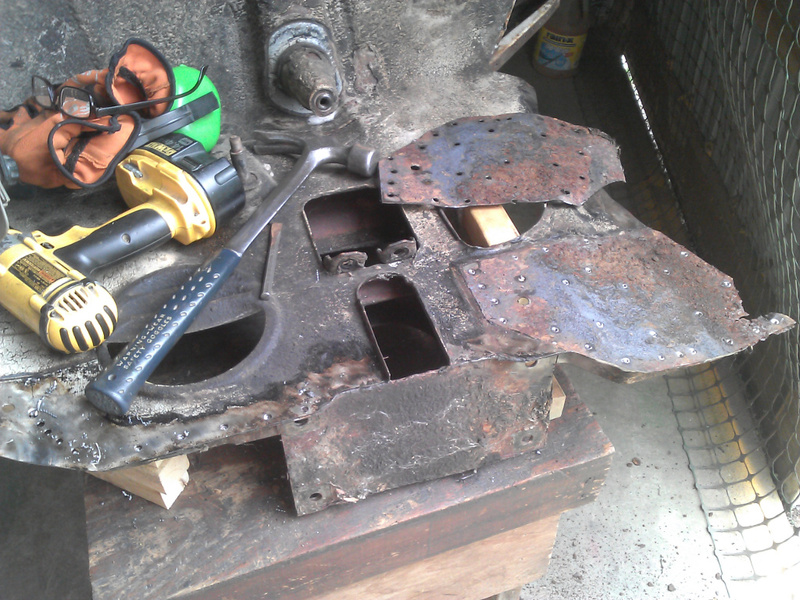 Here, I’ve removed the rusted extension plate or patch that Saab used, and the underlying wheel housing metal was pretty bad also. 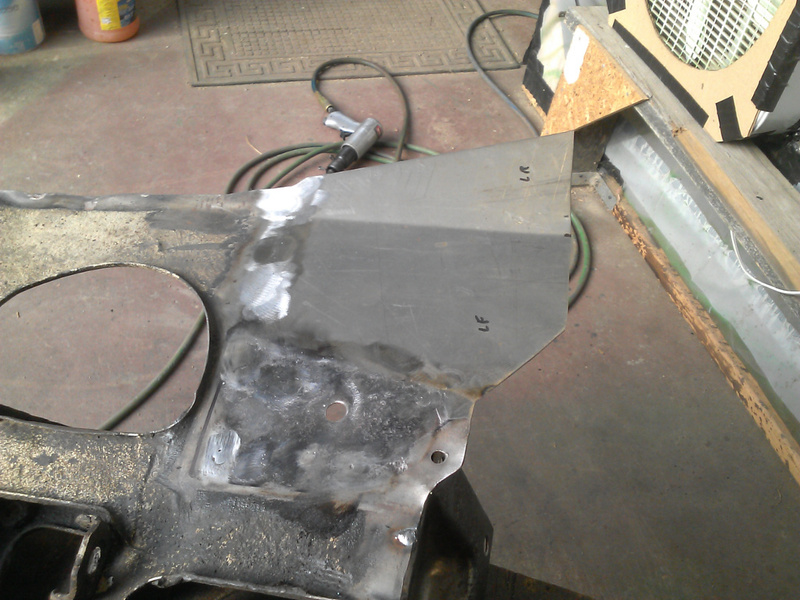 So, I had to also cut away a large, maybe 8″ square section of the wheel housing. Patches for this corner are shown further down this post. 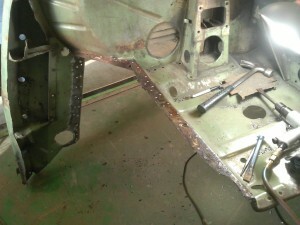 The patch for the top rear corner was more critical than the others. 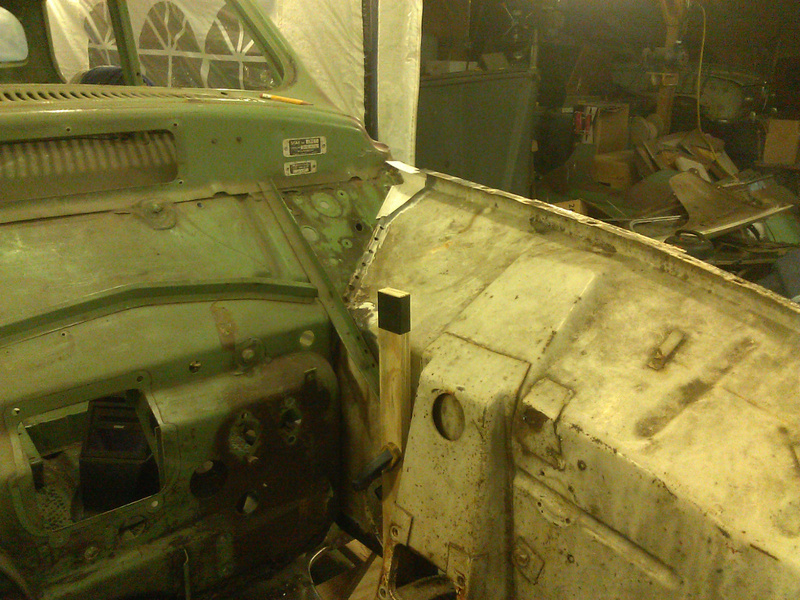 Its alignment had to be perfect to mate up with the remnant at the A-pillar. So, I temporarily mounted the wheel housing, in perfect alignment of course, so I could make a template for the patch. After making a top corner template, I cut and shaped a patch to fit. Then I realized that the wheel housing had to be remounted before I could tack weld the patch. It was the only way I could get a guaranteed fit. 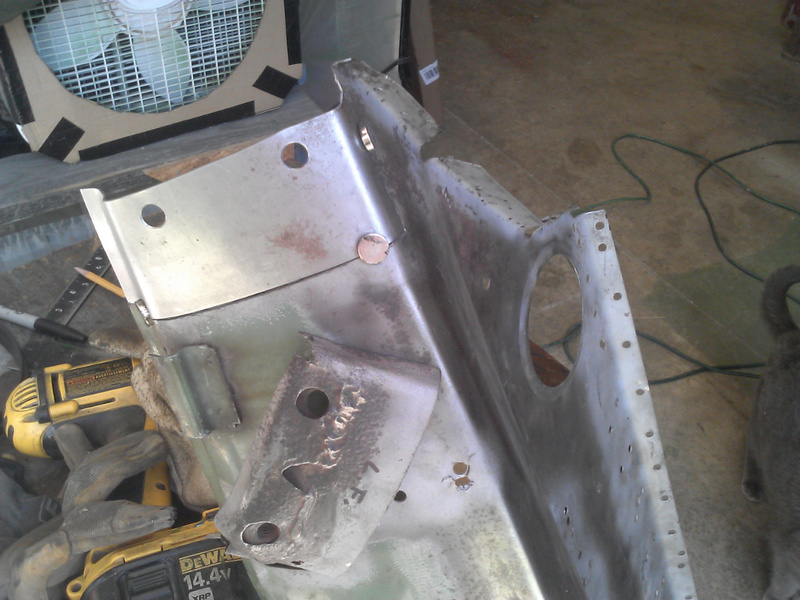 In a process identical to what I did on the passenger side, I cut out the rusted bumper mount area and made a patch and new reinforcement. I found mini super magnets to be great for holding patches in place for tack welding. Just have to be careful not to weld near one—guess where the molten metal goes. And fingers get pinched now and then by their powerful magnetic force. 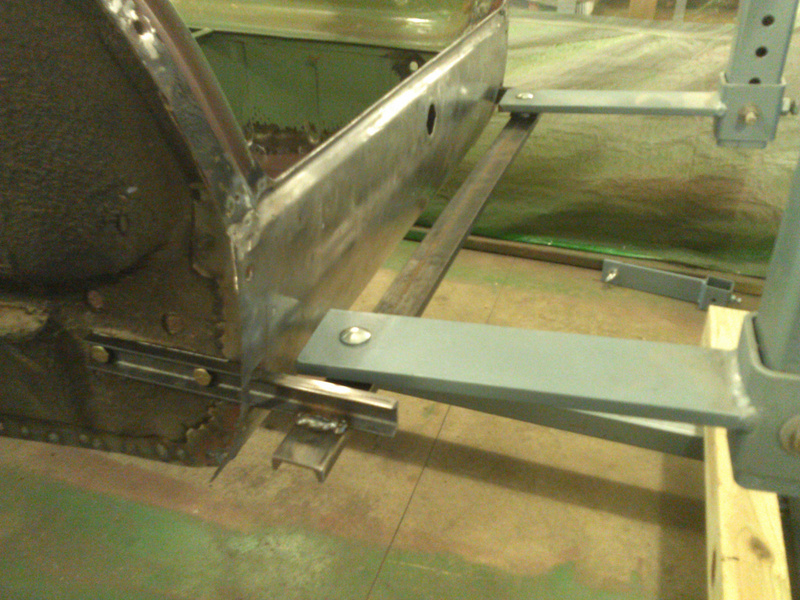 The second photo shows the 16 ga reinforcement welded in place. 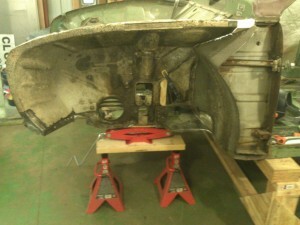 This photo shows the bottom rear corner of the wheel housing after replacing the rusted corner. 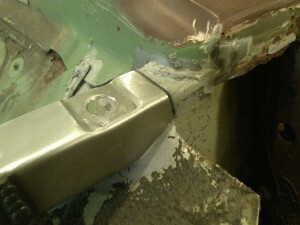 This is before adding a new extension plate. 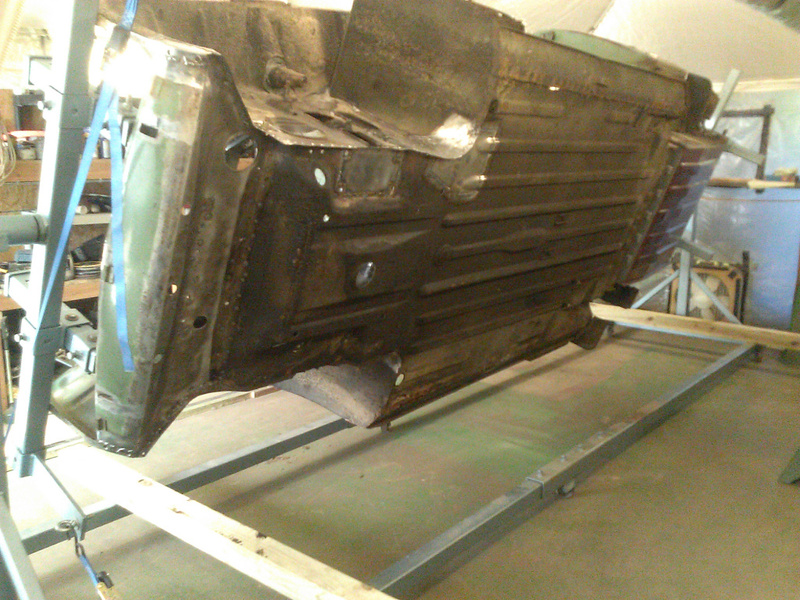 This is the way Saab made the cars back then. 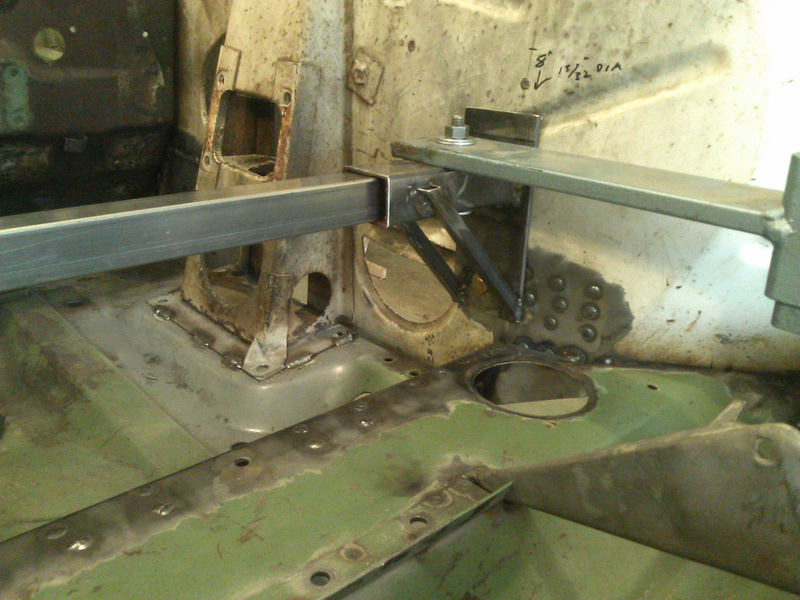 I’m guessing that the older bullnose wheel housings no longer fit when they angled the firewall for suspended pedals in the longnose cars, but they didn’t want to invest in new tooling and just added an extension/patch plate to fill the gap. That is shown further down in this post. This photo shows the patched bottom front corner of the wheel housing. 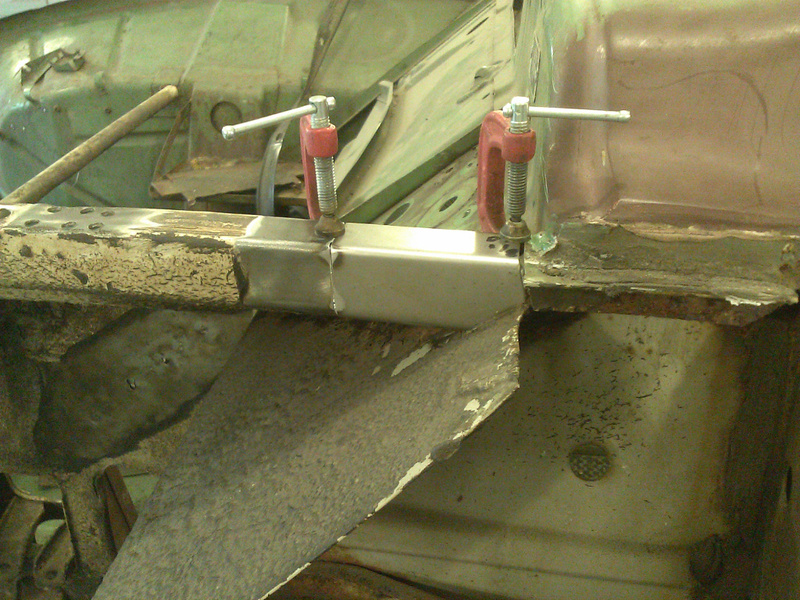 I cut the V-shaped slot only to match the shape of the original wheel housings. 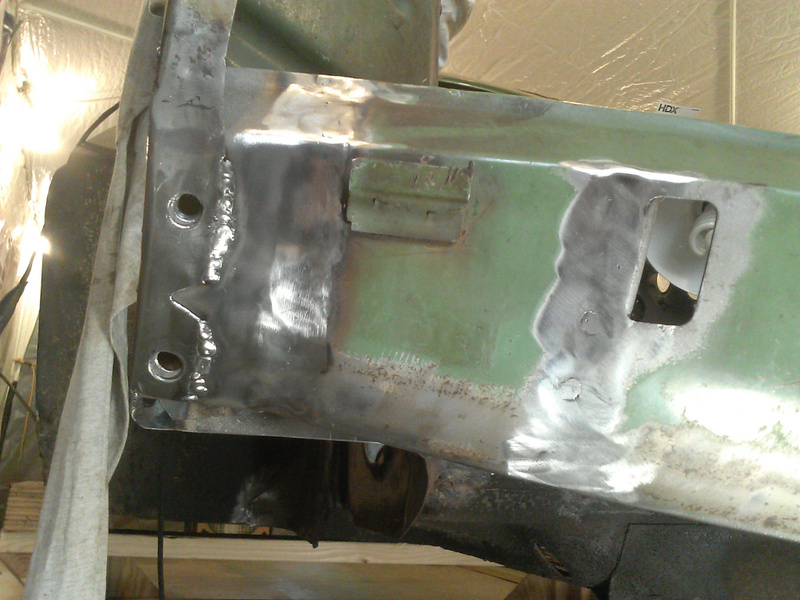 I later welded a nut to the top hole as Saab did on the original, except that I used a grade 8 flanged nut. 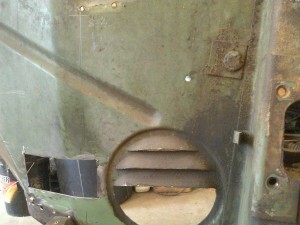 With the donor wheel housing remounted in correct position, this photo shows the great match of the top corner patch to the A-pillar. 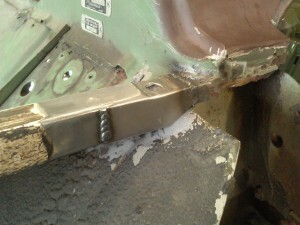 The weld gap is as perfectly aligned as I could hope for and of correct width. 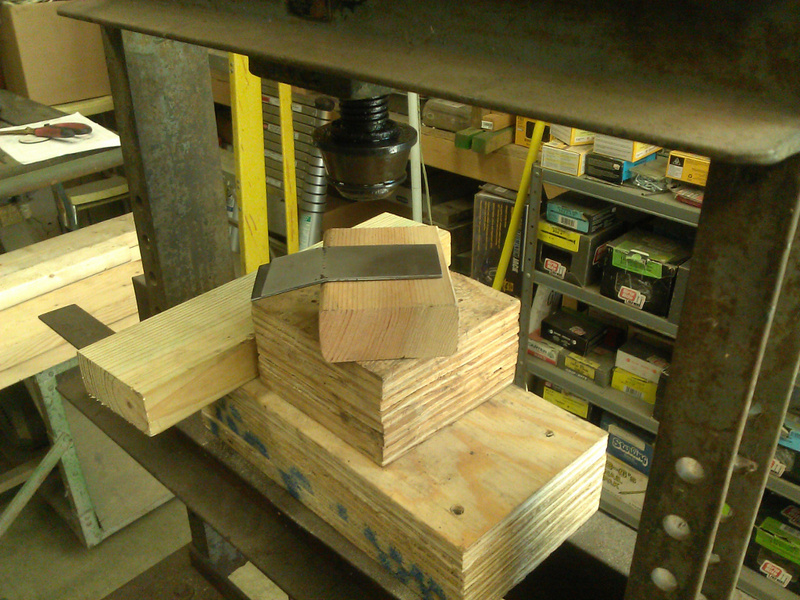 I formed a recess for the mounting hole similar to the original—a little rough but it won’t show. Here I have welded the donor wheel housing to the firewall, and I have plug welded enough of the bottom flange to lock the donor in place. 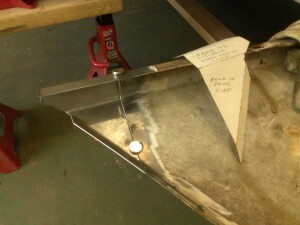 The closeup shows the welding on the top corner, prior to some cleanup grinding. These photos show the bottom corner extension being shaped to fit, and later welded into place. The fit and finish is as close to original as I could have hoped for. 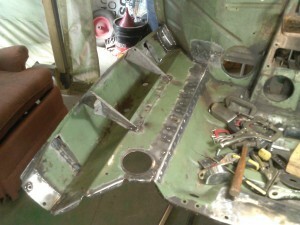 Here you see the nearly finished donor wheel housing. A new wishbone brace has also been installed in the engine bay. I used a 16 ga tube in place of the original 20 ga tube which was bent. 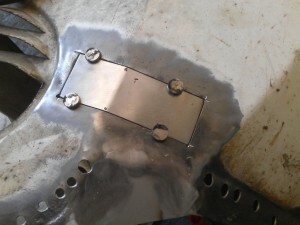 You might have noticed a 3/8″ threaded rod passing though the bumper mount holes, with a piece of 1/2″ x 1-1/2″ channel held by a nut on the outside. 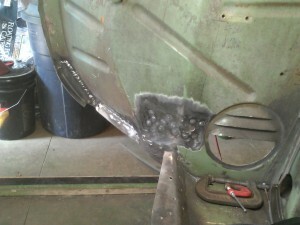 The reason is that welding the bumper mount patches caused the wall to distort somewhat toward the outside. Tightening the nut allowed me to gradually, and precisely, straighten the distortion. 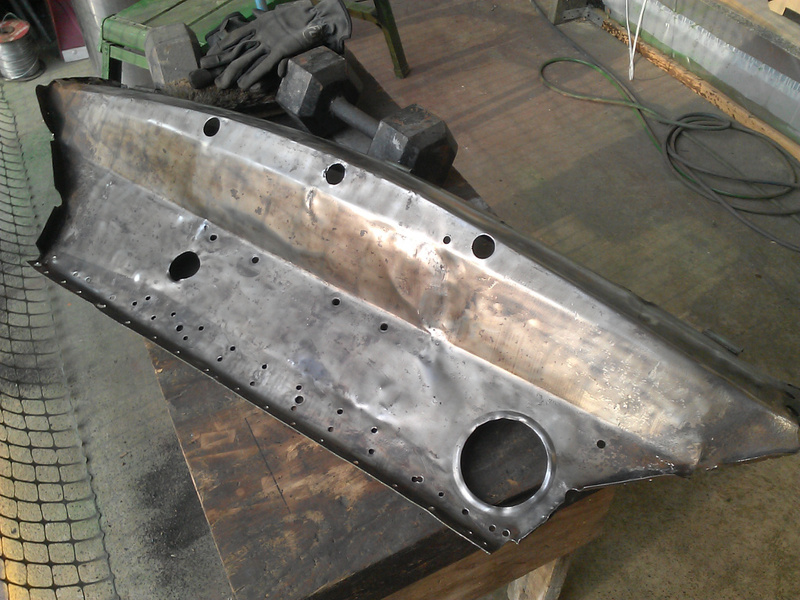 After finishing the donor wheel housing welding, it was time to check dimensions, straightness and hood fit. I was extremely happy to find all dimensions matched the shop manual dimensions and other dimensions taken from another survivor 96. I had the car sitting perfectly level, and I took a good 4 ft level and tested many positions from the back of the car all the way to the front. The bubble stayed centered all the way! 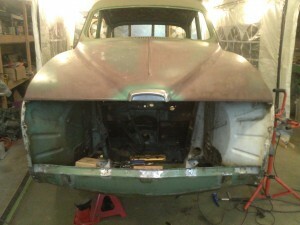 You can see in the photos that the hood fits very well. Finally, Up Onto the Rotisserie! I found the rotisserie to be much higher than I had visualized. 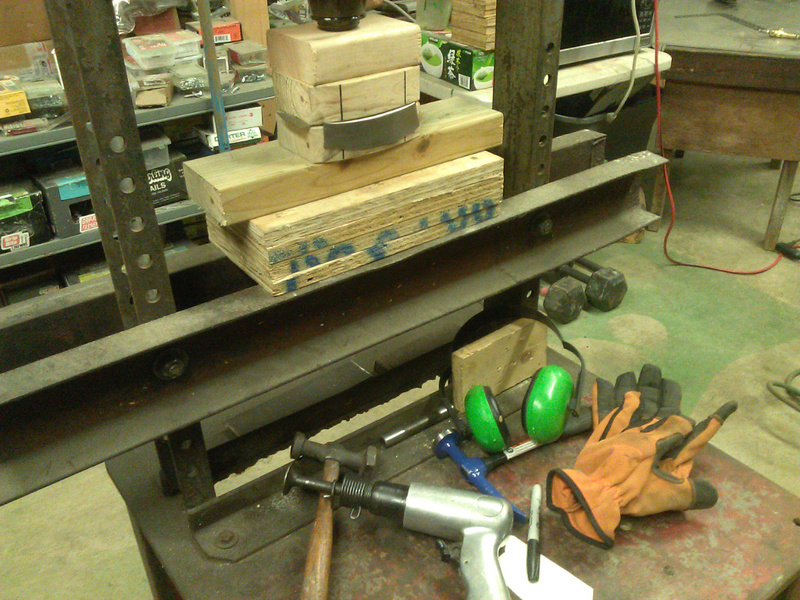 Jacking each end with a bottle jack sitting on blocks was tedious but worked. 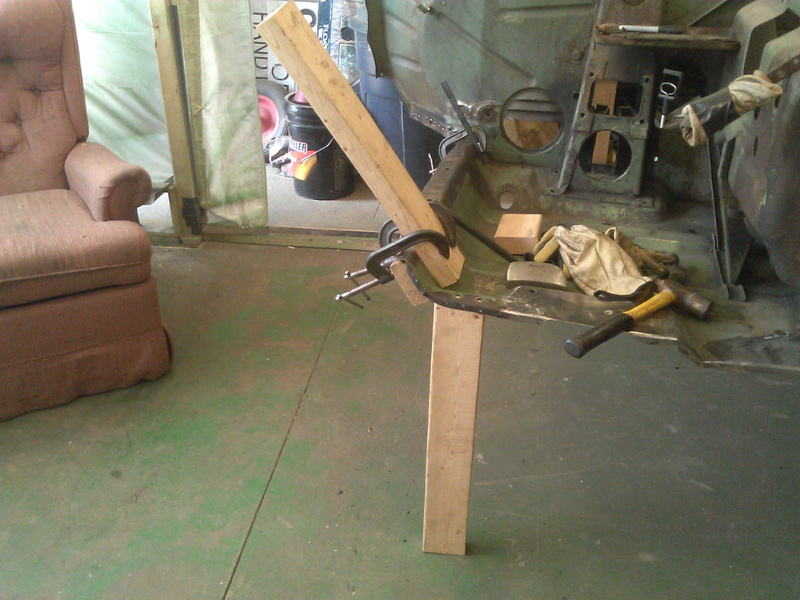 I would run out of jack travel, set jack stands in place, add a block and repeat until the car was high enough. These photos show the rotisserie adapters I cobbled together using whatever metal I had laying around. Up front, the adapter attached to the reinforced bumper mount hole. This allows the adapter to pivot in one axis. The cross tube isn’t welded; it’s a slip fit that keeps the adapters from tilting in one axis but allows movement in others. At the rear, I just used 1/2″ x 1″ channel from the bumper mount, and 1/2″ x 1-1/2″ channel crosswise, welded to fit. 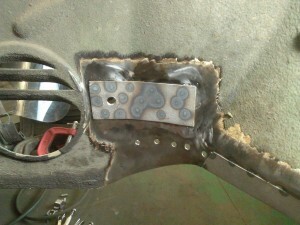 There is a 1/8″ x 1″ spacer between the 1″ channel and the wheel housing wall. Also, as seen in one photo, I used rubber bushings on top and bottom sides of the 1/1’2″ channel so the rotisserie arms could pivot up/down without stressing the channel. I could have chosen better dimensions up front to eliminate body interference, but it works well enough. Just when I thought all was ready, I found the center of gravity of the MC850 body to be much lower than I guessed. This made it too hard to rotate the body by hand. I just used ratchet straps to raise the body further. This worked good going up—not sure how I’ll get it down but that’s a problem for another day. Ta Da! Ready to attack the floor and rocker panels! Oh joy, it sounds like sooo much fun! Ha! 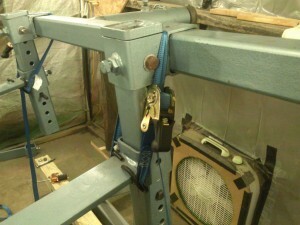 You may notice in the photos, this rotisserie doesn’t have an indexing system. I just used a pair of criss-crossed ratchet straps to fine tune and hold the rotation.